July 2018 – After a long and challenging battle leading to court and strong argument made by EFN – our community members have won a significant victory! 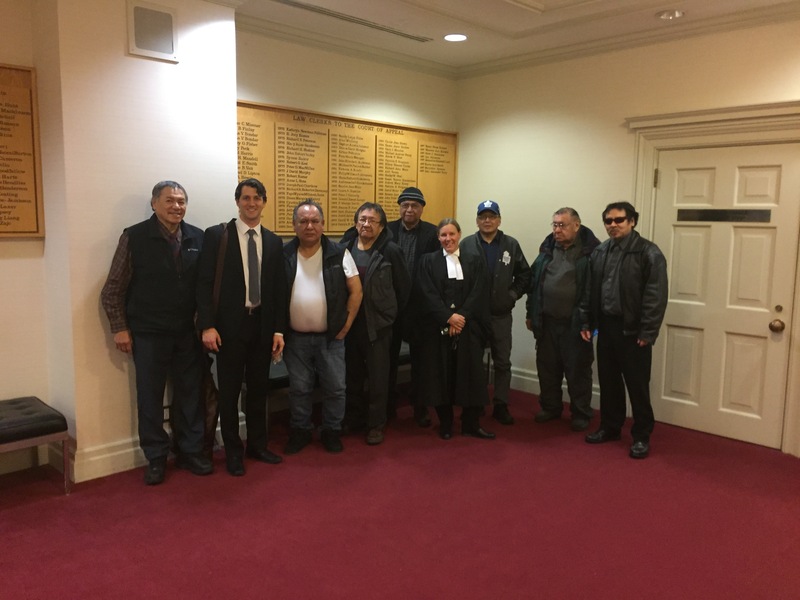 Andy Yesno, EFN Sr Advisor; Peter Siebenmorgen, EFN Resource Stewardship Advisor; Lewis Nate, EFN Economic Development Officer; Charlie Okeese, EFN Councillor; Louie Sugarhead, EFN Councillor; Krista Robertson, EFN legal counsel; Steven Atlookan, EFN Councillor; Temius Nate, EFN member; Ralph Shawinimash, EFN Community Consultation Liaison Officier. The panel of three judges have found that Ontario’s Ministry of Northern Development and Mines did not act honourably in the consultation process and final approval of an exploration permit to Landore Resources. Despite their efforts to appear genuine, both Landore and MNDM hid vital information from EFN and did not engage in the consultation discussions in good faith. On two occasions, Mr Bill Humpries, the CEO of Landore, promised that the project would not go forward without clear support from the EFN community members. Meanwhile, he was working to secure the permit for drilling more than 20 boreholes throughout the Keezhik and Miminiska Lakes areas – a region that EFN members have been working to protect for years due to rich values and intensive hunting, fishing, and other traditional use throughout the area. In this case, the facts only became clear through going to court and gaining access to emails between MNDM and Landore regarding confidential meetings, the lack of dialogue with EFN to address substantive concerns raised by community members, and MNDM cutting the consultation process short without further community meetings when that was agreed upon. At present, the permit has been quashed by the Court. EFN is now pursuing direct dialogue with Minister Rickford and Premier Ford to discuss what steps towards reconciliation Ontario will take, and working to implement a much-improved joint decision making process to avoid situations like this in the future.